Meet Donna, Miss Sissi, Mami, Genni, Luisa, Fiorenza, Auretta, Mirella, Graziella, Charlotta, Celestina, Lucretia, and Anna G. They are a lamp, pots and pans, a chaise longue, a hair dryer, a sewing machine, a bicycle, a corkscrew, and many, many chairs. 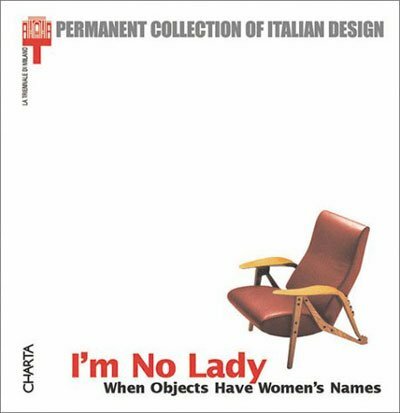 I’m No Lady looks at the many Italian design objects that carry a woman’s name, that are given identity and character by nomenclature borrowed from common, mythological, and iconic female figures. Names are not simply random labels: they are a part of the design, they foreshadow the object, they interfere with the nature of the object itself. And often, hidden behind the choice of a name, are stories and theories worthy of exploration, investigation, and verification. Essays by Augusto Morello, Ugo Volli and Silvana Annicchiarico. cm 15×15; pp. 112; 51 ill. COL e 37 BW ills. ; paperback. Publisher: Charta, Milano, 2002. Request info for "I AM NOT A LADY When objects carry a woman’s name"